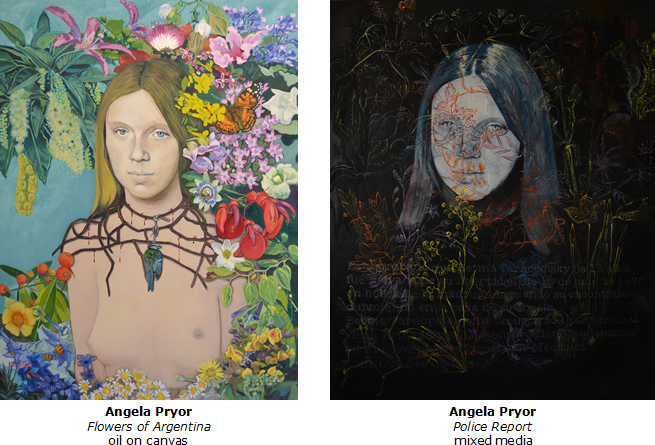 Angela Pryor’s deeply touching paintings, with their unique and haunting beauty, encourage us to acknowledge the existence and then the loss of victims of repression in Argentina (and other countries), the defeated ones who cannot speak for themselves and whose disappearance left no witnesses to speak for them. To this end Pryor chose the image of Betina Tarnopolsky, who at 15 years of age was taken from her grandmother’s house in the middle of the night, never to be seen again. Her parents and one brother and his wife also were “disappeared.” Of this family, only one brother, Daniel, survives today. Pryor’s work draws on iconic images that are instantly recognizable, such as Botticelli’s The Birth of Venus, the Mona Lisa by da Vinci, and Frida Kahlo’s Little Deer. But the familiar faces have transformed into Betina’s face. We feel safe with the familiar historical artworks, but at the same time deeply unsettled by the juxtaposition of an image of a clearly victimized young girl. In Pryor’s works, safety and danger collide, causing us to reassess our world—to realize that these things happened and we cannot afford to forget or look the other way. 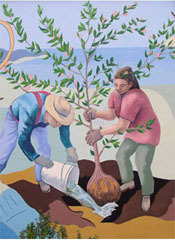 Pryor has studied and exhibited in both Argentina and the U.S., earning an MFA from the SF Art Institute. She teaches at Summerfield Waldorf School in Santa Rosa. The artist will talk about her work on Sunday, January 25, at 2 pm. This is a free event and is part of Sanchez Art Center’s ongoing Artist’s Talk series. Come meet the artist and learn more about her life and work. Sanchez Art Center is located at 1220 Linda Mar Boulevard in Pacifica, 1.5 miles east of Highway 1. Following opening night, the galleries are open Friday, Saturday, and Sunday, 1–5 pm and by appointment, through February 15.